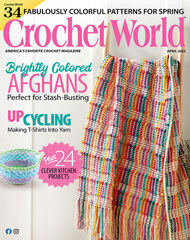 Add some Southwestern flair to your home decor with this free crochet afghan pattern. Featuring Indian motifs, this delightful throw is stitched using tan, black and turquoise yarn. Stitch this beautiful blanket for you or as a gift for a friend! Afghan size: 42" x 52".